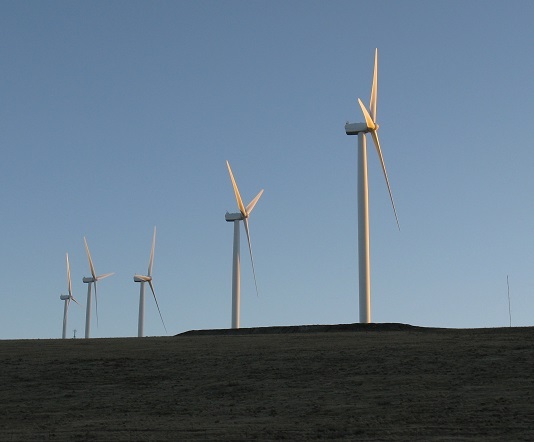 SALEM — Three wind farms – one operating, one approved but not built, and one planned – will be the focus of discussion at the next Energy Facility Siting Council meeting on Aug. 18-19, 2016 in Boardman. The meeting begins on Thursday at 6 p.m. at Boardman City Hall, 200 City Center Circle. On Friday, the Council will start in executive session, with the public portion of the meeting set to begin at 9:45 a.m.
Saddle Butte Wind Park (Gilliam and Morrow counties): The Council will consider a draft final order and whether to grant or deny a site certificate to this proposed facility. Shephards Flat Central Wind Facility (Gilliam and Morrow counties): The Council will receive an update from Oregon Department of Energy staff regarding the facility’s bird fatality monitoring results and consider additional mitigation measures proposed by the site certificate holder. Summit Ridge Wind Farm (Wasco County): The Council will receive an update from staff on the yet-to-be-built wind farm’s 2016 field surveys for birds and plants. The full meeting agenda, including information on accessing the meeting remotely, is available on the Oregon Department of Energy website: www.oregon.gov/energy/Siting/Pages/Council-Meetings.aspx. Is It Time To Chuck That Old Appliance?